As Irishmen and their friends the world over don Guinness hats, wave shamrocks and dust off their Pogues Greatest Hits albums, here at Paul Fraser Collectibles we're staying sober to bring you all the latest collectibles news on St Patrick's Day. And just as being Irish is not a prerequisite for taking part in the St Paddy's day celebrations, nor must you be from the Emerald Isle to appreciate Irish art. London-based auctioneer Bonhams has recognised the growing global appreciation for Irish painters, so much so that it has recently established its own Irish art department and introduced an annual auction. Matthew Girling, Bonhams CEO for Europe and the Middle East, said: "Irish art at Bonhams has a distinguished track record so I am delighted that we will now have our own dedicated Irish art department to celebrate the work of leading Irish artists." 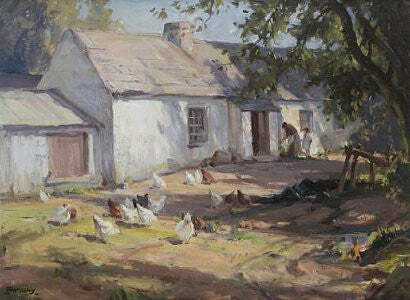 The first sale took place last month, where Frank McKelvey's 1933 A Sunlit Farmyard sold for £18,000. The beautiful work depicts Kate Freeburns Cottage near Bessborough, County Down. During his career McKelvey was widely considered on a level with Paul Henry and James Humbert Craig, two of the most successful Irish landscape artists. Blast of Music, a more recent work by John B Vallely, sold for £13,800 at the same auction. It too could make another nice investment. Vallely is a popular artist with a fine pedigree. In 1968, the Irish Times called him as "one of the more exciting Irish painters under the age of thirty". The message is clear: invest in Irish art and you could find yourself luckier than an Irishman in a field of four leaf clovers.